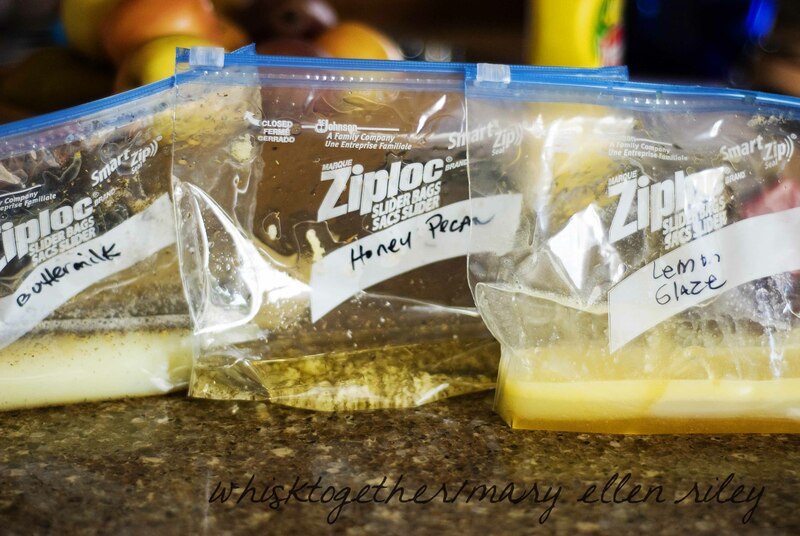 These three marinades come from “Don’t Panic – Dinner’s in the Freezer.” I changed the method though and here is why: Whenever I have chicken sitting in an acidic marinade for a long time, the meat gets tough and breaks up. It looks pretty gross and I’ve tried different chicken breasts from different stores and it all comes out the same. So, to fix the problem I just bag and freeze the marinades separately from the chicken. This method also frees you to make a lot of marinades at one time if you don’t necessarily have enough chicken. Just keep them until chicken goes on sale again. So, next time your grocery store has a chicken sale, take about 30 minutes to whip up these three meals and put them in the freezer. I also have my favorite marinade on this page here – Todd Wilbur’s Fajita Chicken Marinade. 1. In large ziplock bag, pour everything in but the chicken. Work out all the air. There is lots of room leftover for when you add the chicken later. Freeze. 2. Thaw in the fridge overnight. 3. 30 minutes before cooking, add thawed chicken to your marinade. Flip the bag halfway through marinading. 4. Grill or cook until 165 degrees. 1. In large ziplock bag: mix the marinade ingredients together. Work out all the air and freeze. 2. For the sauce: melt butter on low, then add shallot. Turn up to medium heat and add OJ and whiskey and reduce the liquid by half. Add cream and cook until it gets a little thick. Add the rest: honey, cider vinegar, salt and pepper. Cool and then freeze in a bag. 3. To Cook: thaw everything in the fridge. 30 minutes before cooking, put the chicken into the marinade. Flip the bag around halfway through marinading. Heat large skillet with a little olive oil. 4. Topping: mix topping together and put chicken in the topping. Cook chicken to 165 degrees. 5. Sauce: heat sauce in microwave or in a small pot until it is warm. *Next time I’ll try and deviate from the initial cooking of the sauce before freezing. Usually at the make your meals places, you put everything in the bag and not cook it. Then when you want to cook dinner, simply put all the ingredients in a pot and reduce the sauce at that time. 1. Mix the flour and pepper together. Dredge the chicken in it and then place on a cookie sheet. Flash freeze just like freezing cookie dough balls. 2. In a medium bag: mix the butter, honey, juice and soy sauce. Freeze. 3. To Cook: Thaw everything. Spray a 9″x9″ baking pan and put in the chicken. Pour the marinade on top and bake 350 degrees until the chicken is 165 degrees – or about 45-60 minutes. Timing has a large range depending on the thickness of your chicken breasts. they all sound great, hubby does most of the cooking so I have to show him this!